To furnish, decorate and re-decorate a kitchen, whether spacious or small, many elements must be taken into consideration, from the design of the kitchen plan to the arrangement of the furniture and the credenza, the color or The coatings chosen for this part. 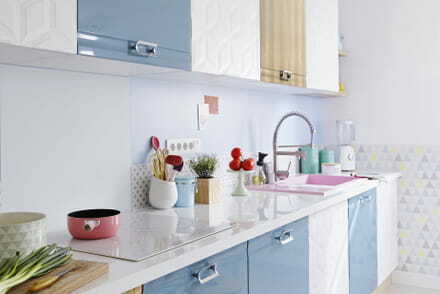 Complete file to see more clearly in the decoration of the kitchen. To offer oneself a beautiful kitchen, it is above all, to think its arrangement . Choosing your furniture and arranging it judiciously in the room remain essential to create a space that is both functional and harmonious. Of course the furnishing of a kitchen is not done on the same model. Several factors come into play: starting with the shape of the room and its surface area that allow to define the plan of the kitchen . Even so, there are some organizational rules that are easy to follow. The distribution of a kitchen is done on three points (this is called the triangle of activity ): a product conservation area (refrigerator), a cooking zone (oven and plates) and a zone Of water (sink, dishwasher …). From there, spaces should be provided for storing and preparing meals in order to limit and make the journey as fluid as possible. Cooking must remain an enjoyable activity. And for this reason, you will preferably place the worktop near the sink. If it is not long enough, do not hesitate to keep under the elbow a board that you will deposit on the sink during your culinary preparations. Is your kitchen open to the living room ? Would you like a central island ? What materials do you want? What color ? What credence ? Will you eat in the kitchen? Above all, ask the right questions, your answers will guide you to the kitchen of your dreams and your needs. Storage elements at the top and bottom! To leave nothing to drag. Yes, but be careful that they are well placed. You must have easy access to your daily cooking equipment : do not climb on the cooktop to catch the bowl or break your back to seize a saucepan. The same applies to all appliances, especially when they are recessed. A lot of accessories have been developed so that you keep on hand, the culinary instruments of everyday life. The worktop must also have an ideal height , so you do not spoil your back by cooking. Cooker: which one to choose? The cooks , both designers, manufacturers and installers of kitchen furniture, are legion. To make a choice, everything will depend on your budget as well as the degree of personal investment that you are willing to provide. For luxury kitchen design Calgary trust the kitchen experts at Bow Valley Kitchens.